Because of our advertisers, Mt. Si Senior Center is able to reach more seniors in North Bend, Snoqualmie and Fall City. With their support we print and distribute 500 copies of our 20 page, full color newsletter every month. ​We are reaching more seniors. Many seniors already know about the resources and activities available to them at Mt. Si Senior Center. But there are many more seniors and aging adults who would benefit from and even thoroughly enjoy a visit to Mt. Si Senior Center. 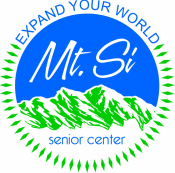 ​If your business serves adults age 5o and older and you would like to be a distribution location for our newsletter, please contact Susan Kingsbury-Comeau at 425-888-3434 or by email at susan@mtsiseniorcenter.org.